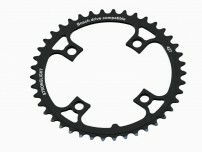 Chainguard for BOSH compatible chain ring (1st and 3rd generation) Ø104mm. 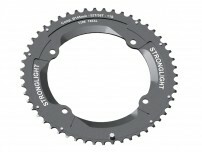 Available in Øout173mm for 38T and Øout193mm for 44T. Comp.E-Drive BOSCH 1 & 3 gen.
For the characteristics of the HT³ please consult the document "Finishing Levels + HT³" in the Download area. Available sizes : 54mm 26" & 48mm 28"
Riveted plastic clips under the mudguard hold the electrical cable going from the battery to the engine. 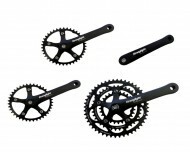 Crankarms: PCD 110 mm 165/170/172.5/175 mm. 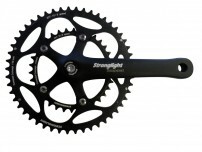 Crankarms: BCD 110/74 mm (triple) and BCD 110 mm (cross-over) 170 mm. 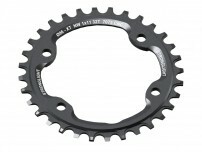 Chainrings: Type 110/74 ST & 110 S (cross-over) 5083. Available teeth combination: 46/34/24 - 48/38/28 - 51/39/30 cross-over: 39 teeth. Recommended bottom bracket: JP 400 aluminium cups length 115 mm (conical square JIS) - reference 205508. 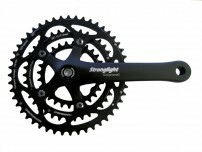 Crankarms: PCD 110/74 mm /170/172.5/175 mm. Kid 54mm 20" & 24"
Product available in "S" version. 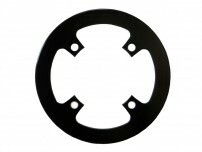 Diameter and width : 20" & 24" - 54mm. "S" version : classic fixation with double V-stays from stainless steel, safe clip. Colors : black or silver. MAGAN B3 - E-DRIVE BOSCH 3rd gen. 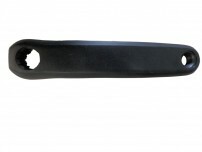 Length: available in 170mm and 175mm. 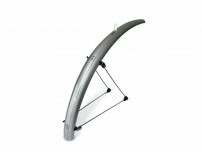 Full Aluminium Mudguard 36mm, 41 mm, 48 mm or 55mm 28"
Full Aluminium Mudguard, 36mm, 41 mm, 48 mm or 55mm 28"
Road Race Chain Ring Type "A" from Aluminium 5083. 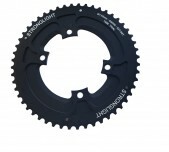 Compatible / Material: Campagnolo - for crank sets with conical square. BCD 135 mm, silver, 10/9 speed.